Under Angel Skies by Liv Kalay Hernandez comprises twenty-eight poems. Unlike Ms Hernandez' Addicted to You, the first collection presented by this author that I had the pleasure of reviewing, they are mostly written in a traditional way rather than her previous freestyle. None are long, but all feel very complete and demand an immediate reread. The subject matter is love, but the aspects of love encompassed are very wide and change throughout in no particular order. This holds the reader’s interest as you can never be sure what the next page will bring. 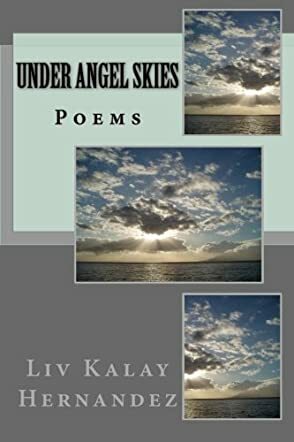 Liv Kalay Hernandez has composed a very different selection of poems for her Under Angel Skies collection. Between them, the twenty-eight short, mostly traditionally rhyming verses, express some of the many ways that love is felt or given; they address conventional love between a man and a woman, the love of a mother for her child, and, surprisingly, love that turns to hate, and jealous love. My personal favourite from the mother-love theme is Funny Face. Golden Years is a beautiful study of love as life approaches its end: I found it comforting, not sad at all. The shocker, accidentally or ironically placed number thirteen, is Shadows. The one truly freestyle poem is My Eternity and I loved it for its rhythm. It vies for first place for me with Two Halves of a Heart, but everyone will have their own favourites. I warn readers before you open the book that it is not an easy choice to make: just enjoy them all.